The faculty of Mass Communication holds a press conference prior to launching the 2nd international conference on ” Media and Tolerance” on Sunday 26/11/2017. The press conference was presided by Prof. Fawzi Abdel Ghani, the faculty Dean. It was also attended by Dr. Ragaa El Ghamrawy, the conference Secretary General; Dr. Al Sayed Al Saeed, the Deputy Secretary General, the conference executive body, some media personalities and journalists. More information on the 2nd international conference on “Media and Tolerance” conference will be revealed in the press conference: days of the conference (28-29 November), conference goals, the participating research topics in Arabic and English, bodies and public figures to be present in the conference. 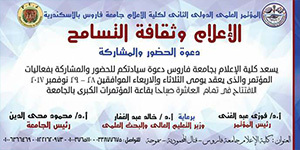 The conference will be held under the auspices of Prof. Khaled Abdel Ghaffar, the Minister of Higher Education.